The first thing David Zhou does after turning on the engine of his Peugeot 307 every weekday morning is to tune in to Beijing Traffic Radio. Just like 1 million other listeners, the company director said he likes the station as it gives him the latest traffic information. However, he still has to take his normal route, even if he finds out there is congestion. "The radio just informs me of traffic jams, but what I really need is advice on the quickest routes," the 34-year-old said. 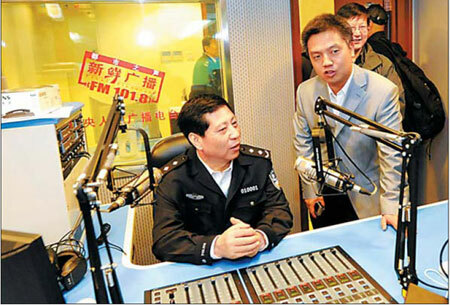 Thankfully for Zhou, his wish might be about to come true, as five national and local broadcasters, including Beijing Traffic Radio, moved into their new live broadcast room on Friday at the traffic command headquarters of the Beijing traffic management bureau. Song Jianguo, chief of the bureau, said: "With just five days to go to the 100-day countdown to the opening of the Olympics, the traffic and security work for the Games is at a crucial stage." A top priority for the bureau is to provide real-time information on the best routes through the busy city; just what Zhou said he wanted. Last month, 3.23 million vehicles took to Beijing's roads every day, and the number of car owners is rising by about 1,300 a day, which makes controlling traffic a real challenge. At their new headquarters, broadcasters will have access to the very latest traffic information, which they will pass on to listeners, Song said. The traffic management system monitors 80 percent of the road network in urban Beijing, so wherever and whenever there is a jam or an accident, broadcasters will know about it, he said. "With this system, we will be able to help people make smoother and faster trips through the city during the Olympics," Song said. During the Games in August, official Olympic vehicles will be given priority and the traffic bureau will be able to track up to 5,000 of them at any one time. Police officers will also be equipped with digital radios, which means they can be dispatched much more quickly to problem areas, he said. Zhou said he will stop driving his car during the Games and take the subway instead. However, he said he hopes the new traffic management service will benefit all drivers in Beijing after the Games, so he will never again have to spend 80 minutes driving 20 km to work, as he did one day last month.